With around 25 per cent of a home’s heat lost through the roof, insulation is hugely important when it comes to building or repairing a roof. 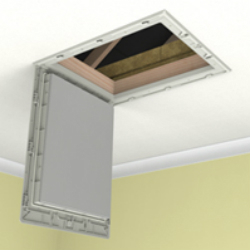 Roofs are designed to minimise the amount of heat that can escape from a building, so the last thing you want is a gaping hole in your ceiling or a poor quality loft access hatch that allows heat to escape. Ashbrook Roofing can provide the solution to this problem. We supply insulated loft hatches, which are designed to prevent draughts of cool air from the loft space entering the home. This means lower heating bills and a warm, comfortable environment for you and your family. Whether you’re a DIY expert, you’re supplying materials for a contractor or you’re in the trade yourself, we offer the same outstanding trade prices to all of our customers. We also offer free and impartial advice and support, to help you find the right products for your project. If you have any questions or would like more information on a product, including loft doors, contact our team of skilled roofers today. Order your items online from Ashbrook Roofing and receive next day delivery when you order before 2pm.